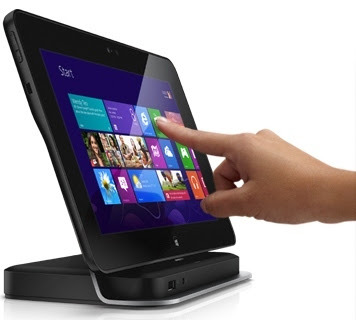 The vast majority of Windows 8 tablets are hybrid devices that transform into a laptop or PC with slide-out, hinged or dockable keyboards.The Dell Latitude 10 is one of the few we have come across that’s just a tablet,but it has plenty of optional extras that enable it to perform all kinds of tricks. The most remarkable thing about the Latitude 10 is that, unlike most current tablets,you can remove its battery and plug in an extended battery which runs for longer,although this is not easy. In our tests, the standard battery lasted an impressive nine hours when playing videos continuously. The extended battery,available for £96, doubles battery life,but adds bulk and increases the weight from 658g, about average for a 10in tablet, to 820g which is heavy. However, removing the battery from its nook is fiddly. You need to slide the release latch,then prise it out with your finger nails. Without the extended battery attached,the Latitude 10 is a reasonably slender tablet, albeit thicker than the iPad and most Android tablets.This extra thickness has been put to good use however–there’s a full-size SD card slot and a USB2 port. Since it runs the full version of Windows 8 rather than Windows RT, the Latitude 10 works with most Windows 7-compatible printers,scanners and other peripherals. It can run older Windows programs, as well as apps downloaded from the Windows Store.You won’t need to buy Microsoft Office as the 2013 Home and Student Edition is pre installed for free–a very useful extra that would cost you £99 if bought separately. There is a downside in terms of performance,however. 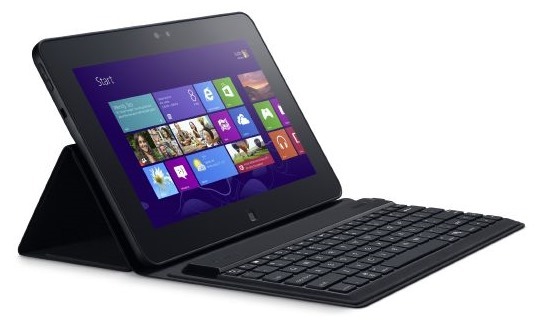 The Latitude 10 is equipped with a 1.8GHz Intel Atom Z 2760 processor and just 2GB of memory. This is fine for simple tasks such as browsing the web and working in Office, but having more than a few programs open slows it down. It plays standard definition videos from YouTube and BBC iPlayer just fine,but it can’t play high definition videos smoothly, either on its own 10in display or on a connected TV or second monitor.The upside to this poor performance is the absence of distracting cooling fans and vents which are necessary on devices running on more powerful Intel chips. It has a 64GB SSD, which is large for a tablet at this price. But the catch is, with Windows and Office installed, only 26GB is left for you to add programs, apps and media files. Although you can use USB and cloud storage to increase capacity, it’s a shame there is not an option for a larger built-in SSD. Dell has squeezed 1366x768 pixels into the 10in display. It’s bright, but text looks fuzzy and the backlight is somewhat uneven–the bottom of the display (when held horizontally) is a little brighter than the top. Image quality is still good though, with accurate colours and wide viewing angles. It also works well as a touchscreen, responding quickly and accurately to our finger taps. You can use the touchscreen with Dell’s stylus, which costs an extra £40. The stylus is pressure-sensitive, which means the harder you press on the screen the thicker the mark you make. This would be useful for aspiring artists were it not for the tablet’s poor performance running complex graphics programs. Although its rear has a soft touch texture, it feels slippery. A range of cases are available that make the tablet easier to grip and act as a stand, with a nook for stowing the stylus. 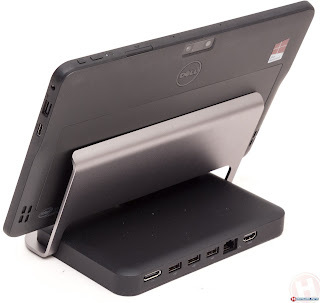 However, in a glaring oversight none of Dell’s own-branded cases fit the Latitude 10 if the extended battery is attached, and we have not found any others that do. Another useful accessory is the docking station,which costs an extra £130. Slot the tablet into this and it will have access to a Gigabit Ethernet port,a full-size HDMI socket and four USB ports.Connect a keyboard,mouse and monitor and you can use the Latitude 10 like a desktop PC.The connection between the tablet and dock feels a little flimsy, though, and the tablet’s screen sits at a fixed angle, although we found it comfortable enough to use at a desk. 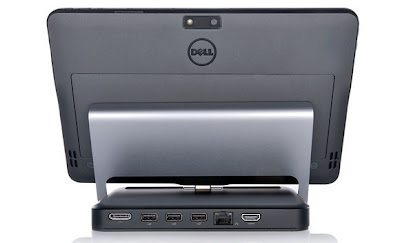 On paper the Dell Latitude 10 looks ideal–an inexpensive Windows 8 tablet with Microsoft Office included. But it’s not helped by the patchy selection and dubious quality of touchscreen apps in the Windows Store.The Latitude 10’s ability to run existing Windows programs and its potential as a fully edged desktop PC is undermined by its poor performance and the need for costly accessories. The price of the Latitude 10, the extended battery,a case, the stylus and the dock comes to £805 almost £100 more than the 64GB Microsoft Surface Pro and only £50 less than a quality ultra-portable laptop such as the 11in Mac Book Air. Think very carefully about what you want from a portable computer before buying the Latitude 10.